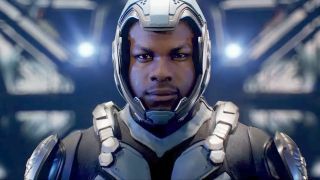 Despite ostensibly being a big-budget Hollywood film with stars like John Boyega onboard, Pacific Rim 2 (okay, it's actually called Pacific Rim Uprising) has been relatively shrouded in mystery since its announcement. But not anymore. A new trailer and interview has given fans a ton of new info about this mechs vs giant monsters movie. This is a tale about robots punching monsters in the face, and it looks like we'll get plenty of that here. The trailer shows off new Jaegers (mechs) and Kaiju (monsters) - including one that towers over the Jaegers (which are already basically walking towers so... yikes). Meanwhile, Boyega spoke with Entertainment Weekly about the film, and outlined his role in the plot: "Jake [Pentecost] is the prodigal son," Boyega said. "He is a young guy who was on the cusp of greatness in his early days when he was training to be a Jaeger pilot, but he always had a troubled relationship with [his father,] Stacker. I’m the son he didn’t really talk about in the first film … the product of Stacker’s first love." Boyega said that Jake never felt like he could live up to his father's expectations, and so he set out on his own and lived life as a black market criminal. The law eventually catches up with him, and Jake joins up with the Jaeger program to make up for the trouble he and his friends have caused. Along the way, he'll bump into Mako, the woman that Stacker trained and watched over since she was a little girl (I sense jealousy issues cropping up). He'll also reunite with an old buddy named Lambert, who will act as his co-pilot in the new Jaeger, Gipsy Avenger. And speaking of new Jaegers, Boyega has the lowdown on those too. Saber Athena (the orange one) is apparently the most agile of the new bunch, with pilots who know martial arts. "She has two swords she can join together to slice stuff down. She’s flexible and very fast," Boyega said. Titan Redeemer (the olive green one with huge shoulders) requires three pilots: two to drive and fight, one to fire a gun and missiles from the chest. It also has an enormous, bladed wrecking ball-like weapon it can shoot from its hand. Guardian Bravo (the red and white one) has electric whips, and was built to be a stocky, tank-like mech. And then of course there's Gipsy Avenger, which is an upgrade from Gipsy Danger as it appeared in the first film. It now has holograms and a redesigned cockpit so that pilots are no longer locked in by their feet. Boyega said that it's the strongest of the new crew, but also the most difficult to operate. It's a lot of new information about a movie we barely knew anything about just days ago, but it all sounds very exciting. The giant-scale brawl will arrive in cinemas on March 23, 2018.